Andy Cashmore is Station Commander for the West Midlands Fire Service, based in Birmingham, U.K. He is currently a manager in the Technical and Operations Support Directorate and has been a member of the team that operates the WMFS unmanned aircraft. Increasing Human Potential recently had the opportunity to talk to Andy Cashmore and learn more about his work and how his team use UAS. How did you first become involved with unmanned aircraft? West Midlands Fire Service has been operating an unmanned aerial system since 2007. We had been looking at the technology for some time, and a project was established to identify a system which could meet our needs. With the purchase of a system in November of that year we became one of the first fire and rescue services in the world to use UAS to gather data to inform the incident commander’s risk assessment for emergency response. 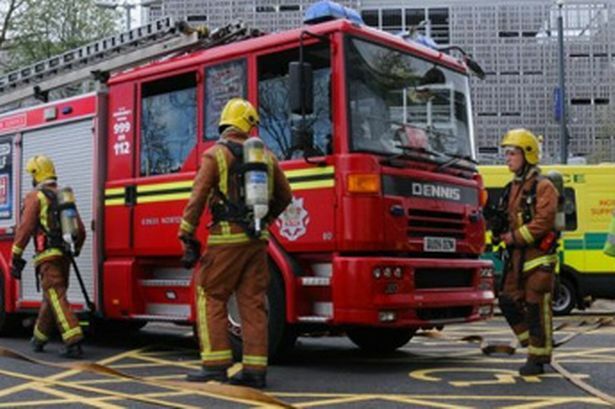 I was one of the small team of fire officers who were trained to operate the equipment, and I have regularly used a number of systems since that time. What has been your primary use for them at the WMFS? The equipment has been used in the following situations: large fires (factories, reclamation sites, large buildings, etc. ), technical rescues from collapsed structures, wide-area search for missing persons and casualties, incidents involving hazardous materials, incidents involving compressed gas cylinders (acetylene, etc. ), assessing key sites for hazards and risks, and training exercises. At incidents, it will be used to identify casualties or people in need of rescue, the direction and speed of fire spread, damage assessment, water supplies, rendezvous points, access and egress to the incident ground, evacuation zones, cordons, and environmental impact assessment. What aircraft are you using, and which ones would you like to use in the future? We recently carried out a review of our capability, which resulted in the development of a business case to support the replacement of our first system, as that had reached the end of its asset life. In developing our user specification and carrying out research into what was available on the market, I identified that there was no one system which could meet all of the elements of our requirements. So, I decided to purchase a system which could deliver the majority of our requirements in a single package and then a smaller, more cost-effective system which could be operated in areas where there was a potential risk of the flyer sustaining damage, either from the enclosed environment we were operating in or from the effects of the hazards in that area, whether that is heat and smoke or hazardous substances. We are operating two systems at the moment — the Aeryon Labs Inc. SkyRanger and the much smaller DJI Phantom 2. The SkyRanger provides us the capability to operate in wind speeds of 40 mph (gusts of up to 55 mph), with a dual sensor EO/IR [electro-optical/infrared] payload and a battery life of up to 40 minutes. The Phantom 2, with the Zenmuse gimbal and a GoPro Hero 3, provides us with excellent high-definition imagery from an extremely cost-effective platform. What has been the most interesting event that you have used them for? We have responded to numerous events over the last few years, and on one occasion we provided assistance to a neighboring police service who had been informed of a missing child that had been seen playing near a frozen lake, but had not returned home as expected. There was heavy fog in the area, so the police helicopter wasn’t available. We were asked to over fly the lake with our UAS and carry out a reconnaissance [mission] using our thermal image capability. Quite quickly we identified a reasonable heat source in a reed bed near the middle of the lake. The incident commander directed technical rescue operators to gain access to the immediate area of the heat source, using inflatable ice paths and found a roosting swan. A call then came in and confirmed that the child had been found, safe and well at his friend’s house. While the outcome was positive for the child, it also proved the concept of using our system for this particular purpose — one that we had not originally considered — and negated having to put responders into a potentially dangerous situation by having to search the whole of the lake in very poor weather conditions. In what areas are UAS lacking for your work? What would you like to see them do that they don’t do at the moment? One of the big limitations of our first system was its duration (battery life) and its operating capability in terms of weather conditions. We hope that the SkyRanger will go a long way to alleviate some of those limitations. The inherent safety redundancies of the SkyRanger also provide the operator with the confidence they need that any problems with the system or the operating parameters of any adverse environmental conditions will be managed by the operating system, allowing the operator to concentrate on getting the best products for the customer. In my opinion, the biggest reason for the lack of take up by other fire and rescue services is the cost associated with some of the more capable systems. If manufacturers could provide systems with enhanced capability at the cost of one of the more popular systems, like the Phantom 2, then the use of UAS would likely proliferate throughout the emergency services. If I were looking at what the future might bring and how systems may be used, then the ideal would be for a UAS to be sat in a ready state at fire service HQ. Fire control would receive notification of an incident and automatically launch the system, as with any other asset, to the required coordinates. The UAS would take off and fly autonomously to the scene and relay live images back to commanders in the control room who could then manage the incident from afar. The flyer would remain on station until the incident was concluded and then return home and dock itself ready for the next mission. What sort of hazmat detection and response capability would you like UAS to have? We are working closely with Aeryon, the manufacturers of the SkyRanger, to develop an air monitoring and air sampling capability. This would be used to detect, identify and then monitor gases, vapors and other hazardous fire products such as asbestos fibers, in order to protect responders working in and around an incident location by providing enhanced information to inform risk assessments and response strategies. When fully developed, WMFS will have the ability to provide real-time multiple substance detection, identification and monitoring capabilities directly from the smoke plume or downwind hazard area to the ground, without having to commit personnel into the danger area. I believe that the introduction of this capability will reenergize the use of UAS within the emergency services environment and is likely to increase interest from other potential users of the technology. Moreover, it will identify WMFS as world leaders in this field. How has the regulatory scheme for UAS flights in the U.K. affected your work? What would you like to see done differently? WMFS UAS capability could be called to operate in any part of the West Midlands region, but invariably it will be flown in an area which is managed by either fire service personnel or the police using a series of cordons. The inner cordon is usually managed by the FRS and is typically surrounding the immediate scene of operations. This area is strictly managed, and only the minimum number of personnel are permitted to enter the area and then only for specific tasks. The outer cordon is usually managed by the police. All responder resources will be located between the inner and outer cordons, and it is within this area that the UAS is intended to be flown. Because of this, I think I am safe in saying, we are seen as safe and responsible operators by the U.K. Civil Aviation Authority. We have worked closely with them in developing our standard operating procedures and the way in which we operate our system at incidents and adhere to all of the requirements of our Permission to Operate Small Unmanned Surveillance Aircraft. I find the CAA very pragmatic, approachable and helpful, and for those reasons we find the regulatory scheme very user friendly. I am aware, however, that other users believe that change is required to enable them to meet the requirements of their needs and for manufacturers to develop the technology further. What has been the public response, if any, to your use of unmanned aircraft? We have been at pains to ensure that we promote the use of UAS for the good of the public and have taken numerous opportunities to advertise our use of the capability to the people of the West Midlands. This has been done through local and national media and demonstrating the equipment at shows and exhibitions. We regularly attend fire stations and preplanned training events to demonstrate the benefits of the equipment to commanders and operational crews. We have received very few negative comments from our customers, but the subject of money is never far away, and we have had one or two freedom of information requests on the subject of initial and ongoing costs of maintaining our capability. However, we believe that the system offers value for money as the benefits of having the system available far outweighs the costs of developing it.